Our 4oz. 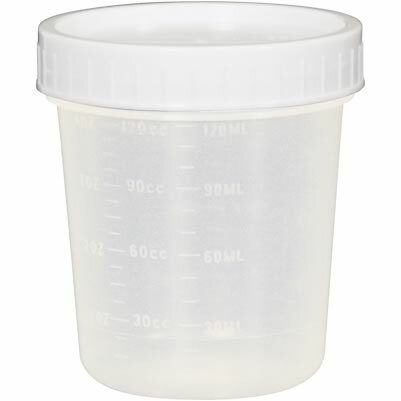 / 120ml non-sterile graduated polypropylene sample containers (let's be honest, they're urine specimen cups), have threaded lids, are translucent, unbreakable and chemically resistant. Accurate easy-to-read graduation lines in cc/ml (10-120 in 10ML increments) & FL OZ (1/2oz - 4oz in 1/2oz increments).The containers tolerate strong acids, alkalies and most organic solvents. These containers measures 2-1/2" in diameter by 3" in height, and the full-turn screw thread lids provide for a leakproof seal.